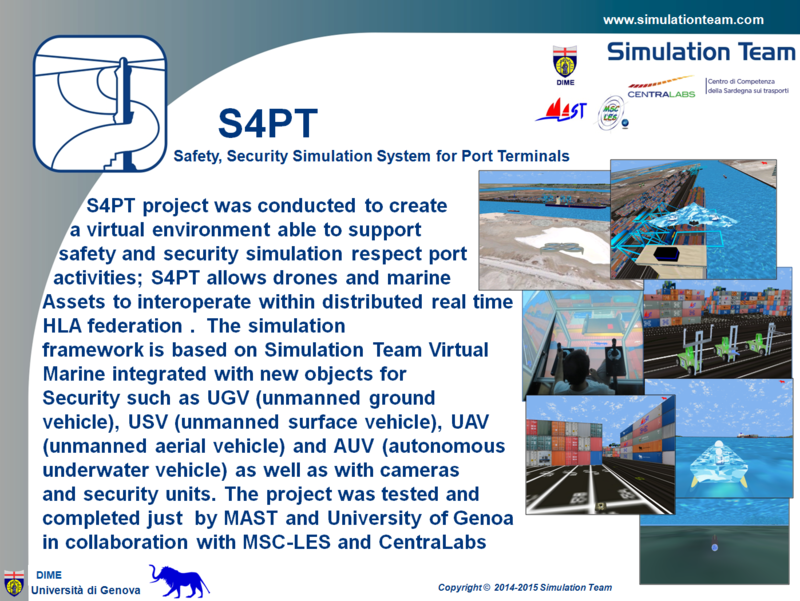 S4PT project was conducted to create a virtual environment able to support safety and security simulation respect port activities; S4PT allows drones and marine Assets to interoperate within distributed real time HLA federation . The simulation framework is based on Simulation Team Virtual Marine integrated with new objects for Security such as UGV (unmanned ground vehicle), USV (unmanned surface vehicle), UAV (unmanned aerial vehicle) and AUV (autonomous underwater vehicle) as well as with cameras and security units. The project was tested and completed just by MAST and University of Genoa in collaboration with MSC-LES and CentraLabs.